Local firefighters received the call of a lifetime when a small fire started in the elevator of the seminary where Pope Francis was staying during his historic trip in Philadelphia. The fire was reported inside the elevator of the St. Charles Borromeo Seminary Saturday around 10:45 p.m. Chief Francis Dixon of the Narberth Volunteer Fire Company described the moment he received the call as "surreal." "It starts to dawn on you, there's a fire and the pope is somewhere else in the building," Chief Dixon said. "The magnitude of the situation comes to the front of your head." Chief Dixon was among the two dozen firefighters who rushed to the seminary after the call was made. It was the first time in five years they had to respond to the location. "I thought we were going to go down there, be up for 30 hours and nothing happens," said Lower Merion Township Chief Fire Officer Chas McGarvey. "And here we go in the middle of the whole night, we receive a fire alarm and go." Chief McGarvey told NBC10 he started planning for the pope's stay in July and had his firefighters stationed on the seminary grounds during his visit. By the time firefighters arrived the flames were already out. No one was evacuated or hurt during the incident. 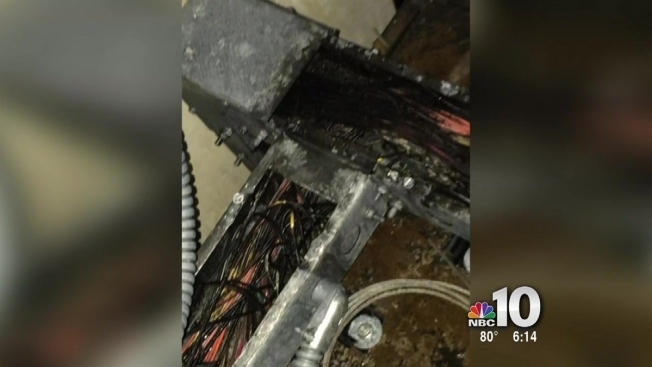 Authorities say it appears an electrical malfunction in the wiring was the cause. After getting the call Saturday, the responding firefighters received an even bigger surprise the next day, a personal thank you from the pontiff himself. "We were invited with the catering staff as the Holy Father was leaving and got to kiss his ring and shake his hand," Chief McGarvey said. "He has an effect on you. They call it the Francis effect. I don't know if I've ever felt that way in my life."